Agricultural and seafood exports were expected to reach 27.5 billion USD, representing a 5.4 percent year-on-year increase; material and minerals 5.1 billion USD, up 6 percent; and processing 196.1 billion USD, up 12.5 percent. Vietnam should focus on restructuring of state budget expenditures, increasing transparency and efficiency in state budget spending with people`s oversight, and avoiding tax evasion and unnecessary tax incentives. The Ministry of Science and Technology (MoST) has issued national standards on chilled meat and technical requirements to meet expectations of markets at home and abroad. To help passengers ensure their journey gets off to a great start, national flag carrier Vietnam Airlines has announced the official launch of its new In-town Check-in service, the first of its kind in the Southeast Asian country. The Middle East is currently the best selection for Vietnamese exporters of canned tuna to expand market in the context that the consumption demand in such traditional markets as the US and the EU are experiencing a slowdown, the Vietnam Association of Seafood Exporters and Producers (VASEP) said. Vietnam updated its food safety law in February, replacing Decree 38/2012-ND-CP with Decree 15/2018/ND-CP, to reduce regulatory burdens and enhance international trade of goods. The country is set to welcome the 15 millionth visitor of the year late next month or early December. The equitisation of state-owned enterprises (SOEs) has been alarmingly slow this year with only nine enterprises having their equitisation plans approved, compared with a total of 85 being required to complete their equitisation in 2018. Vietnam said Thursday it will ratify a sprawling Pacific trade pact that US President Donald Trump pulled out of last year, calling the deal a “disgrace” for American jobs. Parkson recently shut down its shopping center at Cantavil An Phu in district 2, HCM City. To date, the big retailer from Malaysia has closed five malls in Vietnam. Revenue from technology and telecom sectors contributed 94% to the corporation`s total revenue. Vietnam Prosperity Joint Stock Commercial Bank (VPBank) has announced a temporary foreign ownership limit at 22.532 per cent of charter capital to prepare for a private placement. The number of foreign investors, who contribute capital or acquire shares in Vietnamese firms, is surging rapidly, given by the firms’ high growth prospects and the government’s effective actions in improving the country’s business and investment environment. Construction of the expressway that runs 139 kilometers (86 miles) between Da Nang City and Quang Ngai Province started in May 2013. More than 368 exhibitors from 46 countries and territories are taking part in the annual Vietstock Expo and Forum which opened on Wednesday in HCM City. Long-haul destinations take off in popularity, while Milan, Paris and Rome remain the top global cities for MICE bookings. The Vietnamese Government is making concerted efforts to improve business climate for both domestic and foreign enterprises, including those from the Europe, Prime Minister Nguyen Xuan Phuc said on October 17. No more condotels should be built in Vietnam and the focus should instead be on developing existing ones, says Vietnam Realtor. The Vietnam International Industry Fair 2018 (VIIF 2018) is scheduled to take place during October 23-26 at the Hanoi International Exhibition Centre, according to organisers. Japan is concerned about ‘serious’ delays in disbursement of funds for major official development assistance (ODA) projects in Vietnam. Mobikor (www.vinatoon.co.kr co-CEOs Kim Joong-hwan and Lee Jin-woo), Vietnam’s first webtoon service provider, announced that it would join hands with Payone (www.epayone.co.kr CEO Lee Dae-hyeong), digital financial transaction solution development and service company, to provide webtoon service for Vietnamese workers living in Korea. 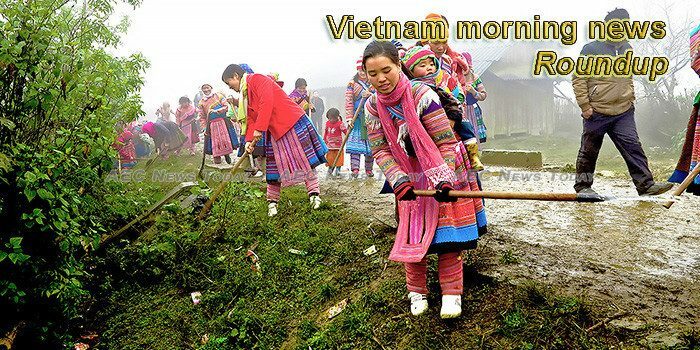 The mental healthcare industry in Vietnam is still developing. The government has established the National Mental Health Programme (NMHP); however, industry observers have noted that the NMHP only covers approximately 30 percent of the country, and uses a very narrow list of mental illness. The seventh annual Buon Ma Thuot coffee festival will be held on March 9 – 16, 2019 in the Central Highlands province of Dak Lak with a wide range of activities featuring the local specialty. A workshop took place in Hanoi on October 18 to discuss ways to foster sustainable and inclusive growth in Vietnam. As Vietnamese smartphone producers are launching new products and Chinese giants are stepping up their game, Samsung and Apple’s hold on the market seems more fragile than ever before.